A referendum to limit migration from European Union countries took place on 10th February of 2014 in Switzerland. 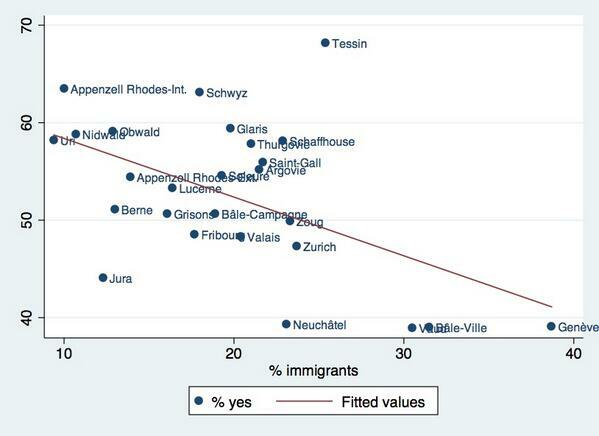 In the score of such event, Alexandre Afonso (2014) and Paul Haydon (2014) did a simple analysis of correlation between the share of migrants population per canton and the share of yes to anti-immigration initiative, based on the results of the referendum. The research question that lies beneath these analysis might be “is there a relationship between the share of migrant population in a given community and the way migration is seen by its members. Interestingly both the graphic and map bellow show that wherever there is less number of immigrants, the rejection of immigrants is greater. It is a clear example of explanatory research, where the main objective is identifying the existence between two or more variables. 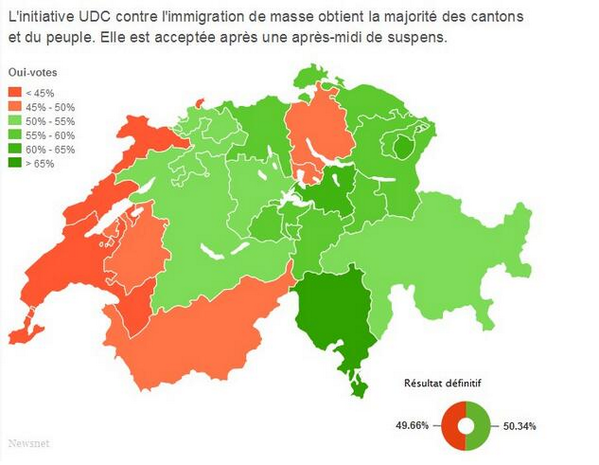 By the way, Swiss voters narrowly back referendum curbing immigration. The results of this case, also arose multiples new questions on how public opinion is build. Is there a real problem with immigrants or rather certain media shape deliberately population opinion? I seen the same factor the other working day once i graphed my zixiutangbeepollen. It does make it easier to adhere to it throughout the months of no reduction! Hi, I just want to ask when this research was conducted? I badly need this for our school task. And also what was the title of this research?